Find hotel near The Saturday Night Market ..
Transpiring every Saturday at 6 p.m. is the Saturday Night Market in Arpora, Goa. A common tradition for the local people, it is a must visit for tourists. This “Mini India” has everything from spices and food stuff, to Kashmiri carpets and clothes. The vibrant atmosphere is contagious as is the music of budding artists who take the center stage. A perfect place to understand and experience the vibe of Goa, you can enjoy delightful drinks, window shop, enjoy music and have delectable finger food. Want to plan a DIY trip? Use Arpora trip planner for the same. Book perfect hotels in Arpora like Treebo Rain Forest Enclave, Treebo Zeebo Suites and Spazio Leisure Resort. Create your own Arpora vacation packages or choose from the ones made by travel experts. Also explore the best ways for how to reach Arpora. Love this? Explore the entire list of places to visit in Arpora before you plan your trip. Fancy a good night's sleep after a tiring day? Check out where to stay in Arpora and book an accommodation of your choice. 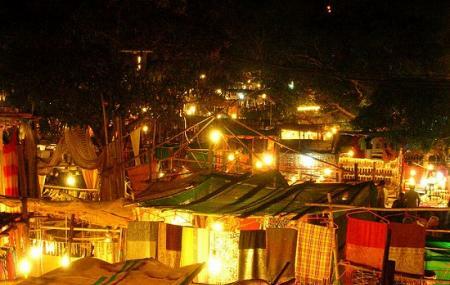 How popular is The Saturday Night Market - Goa? People normally club together Baga Beach and Resort Rio while planning their visit to The Saturday Night Market - Goa.